Do you have an emergency credit card? Most of us do, though there are times when we define “emergency” based on mood fluctuations. While we won’t go into those justifications we tell ourselves as we’re whipping out our emergency card for those to-die for Jimmy Choos, let’s just say most of us could do with a bit of self-discipline – but that’s for another column. The whole idea behind an emergency credit card is that it’s put back, away from temptation, but always close enough should a true emergency come up. Your car breaking down is one idea or maybe the need for a new air conditioning an heating unit would be another example. When you’re clear on what the card is – and is not – to be used for, you can rest assured knowing it’s there when and if you need it. No annual fee – this is really important since it’s going to be tough paying that fee each year if you haven’t even used the credit card. Low APR – A credit card offer with a low or no intro APR for a specific period really shouldn’t be high on your list of “must haves” since you likely won’t even use it in those initial first months. Keep looking for a better offer that’s in line with what an emergency credit card is for. Perks – Of course, if your emergency credit card has perks, it’s nice to have, but again, if you use your credit card for emergencies only, whether or not you have rewards points won’t really matter. That said – if yours does, be sure there are no expiration dates. It could be couple of emergencies could earn you enough rewards points for a free flight or cash back. There are several reasons the Discover More credit card would make a fine emergency card. No annual fee, of course, is one of the pre-reqs, but the fact that Discover maintains its top spot in customer loyalty really says a lot about the brand. The cash back bonus categories are ideal – again – not that you’ll be taking advantage of that often, but over time, you might find yourself enjoying a nice 20% cash back bonus at participating retailers. Also, the 24 hour, 7 day a week access to a U.S. based account manager (guranteed within 60 seconds of you calling) can really help when you’re in emergency mode. There are no rewards redemption fees and you can add additional cards for no added fees (comes in handy if family members on opposite coasts are trying to get home to attend to a family emergency). While we’re stressing the use of an emergency card for, well, emergencies – you should know this Chase Freedom MasterCard offer pays you a $200 bonus cash back if you spend $500 within the first three months of opening your account. Does this mean we condone a charge in order to claim that bonus cash? We’re just throwing it out there in an effort of full disclosure. What we really like about this offer is the 5% categories every 3 months. They might include restaurants, airlines and grocery stores and there are no hassles when it comes to activating your bonuses. For those purchases outside the bonus categories, you’ll earn unlimited 1% cash back with up to an additional 10% cash back when you shop online at select merchants through the Chase network. Finally, there’s no annual fee and your rewards never expire. 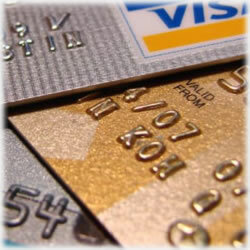 Finally, be sure to double check that there are no dormant fees on any credit card off you’re considering. The last thing you want to do is pay a credit card company for NOT using its card. Life just wouldn’t be real if there wasn’t the occasional emergency or unexpected expense pop up. The best any of us can hope for is access to the resources needed to properly attend to those times. Take a proactive stance and your emergencies won’t seem so overwhelming.